Each kitchen will benefit from having a blender available. This type of appliance is essential to create homemade baby food, smoothies, sauces, or soups. Oster is a trusted name in kitchen appliances. One of the most popular items in the line is the Oster BVCB07-Z Counterforms Blender. Its affordable price and blending abilities attract customers. Here is a closer look at an Oster BVCB07-Z review. The Oster BVCB07-Z Counterforms Blender provides many features to a consumer. This unit is extremely versatile with low, medium, and high manual settings. There are also seven speeds and pulse buttons as well. Frozen treats, soups, dips, smoothies, and sauces are all possible with this blender. The motor is very strong and provides 600 watts of power. It will crush through almost anything. The main container is constructed from a scratch-resistant glass material. It holds six cups of food with ease and can withstand various temperature extremes. It is simple to clean in the dishwasher and includes a pour spout to avoid spillage. Measure markers line the container as well. This will be helpful when adding ingredients for a specific recipe. The blade is made of stainless steel and includes a six-point design. This chops food to an even consistency. Many blenders in the class only contain four points, so the end results will be much smoother with the Oster. The advantage of choosing an Oster blender is the large amount of accessories that are available. Many people purchase additional blades. For example, there is a special milkshake blade that infuses up to 35 percent more air, which thickens the end liquid. There are also portable containers that can be used in place of the large container. These are great for people on-the-go or singles who do not want to dirty a big container. There are many positives associated with purchasing the Oster BVCB07-Z Counterforms Blender. Besides being easy to clean, the unit provides great power that can chop ice and other frozen pieces of food. The metal drive will be very durable and last longer than similar blenders with plastic parts. The high number of setting options serve as a favorite for customers. The seven speeds and pulse levels provide precise control over blending various foods. Most people also appreciate that the unit can withstand extreme temperature changes. This means that a person can immediately remove the container from the dishwasher and blend an icy cold beverage without worries of cracking or damage. The overall appearance of the blender is very attractive. It is designed with black and stainless accents. It will blend well with any kitchen decor, and the compact shape will not take up much space on the counter top. The dimensions of this blender measure 10 X 8 X 14 inches. It weighs under 10 pounds, so it is very lightweight and can be simply moved out of the way when not in use. Finally, the Oster BVCB07-Z Counterforms Blender comes with a three year limited warranty. This should provide peace of mind to any consumer who is considering this appliance. Although the Oster BVCB07-Z Counterforms Blender received positive customer feedback, there are a few cons to discuss. For instance, some people do not like the automatic shutoff feature. This blender turns off after four minutes of use. This is not helpful for anyone who needs to blend items for longer periods of time. However, this feature is meant to help elongate the life of the motor. Also, some people did not like the noise level of this unit. The noise may be due to the powerful 600 watt motor. 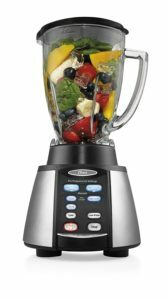 The Oster BVCB07-Z Counterforms Blender is an ideal choice for a person looking for an affordable and versatile appliance. It is priced around $60, but this cost should not mislead customers into believing that the unit is not functional. It does a nice job mixing drinks, soups, sauces, and other meal items. The glass jar and metal drive will provide durability as well. For under $100, a person will be hard pressed to uncover a blender that offers the features and results of this Oster. It is highly recommended for any kitchen. Pros: the Oster BVCB07-Z Counterforms Blender has a 600 watt-motor and can easily chop foods. It is easy to clean, it has a high number of setting options and it comes at a great price. Cons: This blender can be a little noisy and it does shut off after 4 minutes, which can be annoying if you have need to use the blender for a longer period of time.